Java HashMap class contains values based on the key. Java HashMap class contains only unique keys. Java HashMap class may have one null key and multiple null values. Java HashMap class is non synchronized. Java HashMap class maintains no order. The initial default capacity of Java HashMap class is 16 with a load factor of 0.75. 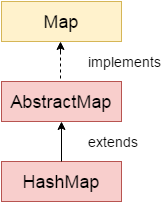 As shown in the above figure, HashMap class extends AbstractMap class and implements Map interface. Let's see the declaration for java.util.HashMap class. Let's see the Parameters for java.util.HashMap class. HashMap(Map<? extends K,? extends V> m) It is used to initialize the hash map by using the elements of the given Map object m.
HashMap(int capacity, float loadFactor) It is used to initialize both the capacity and load factor of the hash map by using its arguments. Here, we see different ways to insert elements. Here, we see different ways to remove elements. Here, we see different ways to replace elements. HashSet contains only values whereas HashMap contains an entry(key and value).